For those bingo lovers out there who fancy a bit of extra romance and sweetness in their lives, then we at Mobile Bingo Bonuses would like to introduce Bingo Fling. This site is the epitome of love, even having its own cheeky cupid slinging arrows, which will hopefully bring us red hot prizes. 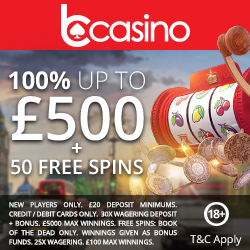 Their incredibly attractive line up of games includes 75 and 90 Ball Bingo, Table Games, Scratch Cards and Slots such as the featured favourites Sugar Train, Irish Luck and Shaman’s Dream. The fact that many of their games are available on mobile devices can only add to the excitement. All you need is a smart phone such as an Android, iPhone or Tablet device and those mundane chores such as commuting to work, just got much more exciting with the possibility of a jackpot win! Registering with Bingo Fling is a quick, easy process and when you’ve made your 1st deposit of a minimum £10, you’ll receive the chance to spin the incredible ‘Wheel of Slots’. There are a number of prizes available, but you could win up to 500 bonus spins on the household names Fluffy Favourites, Temple of Isis and Shaman’s Dream; this can only increase your chances of winning a jackpot prize! Huge £500 Jackpot – Bingo Fling offers a £500 jackpot in their Fortune Fountain on the 1st of the month, every 3 months at 8pm. If you fancy your chances on this eye watering prize, then head to the Jackpots tab in the games lobby. Even if you don’t win the full house you can still receive an incredible prize for 1 and 2 lines. Each player can purchase up to 96 tickets, so get buying and good luck! 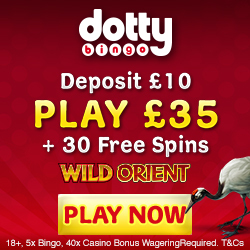 Win Cash Everyday – We’re sure if we say the word complimentary bingo your interest will pique. Bingo Fling offer bingo games every day between 12pm and 2pm, under the 90 Ball Bingo tab in the games lobby. Just make sure you’ve funded your account in the last 7 days to access the room and away you go! Win Entire £50 Jackpot – Join Bingo Fling every Saturday night at 8pm under the jackpots tab, where you could win £50. Each player can purchase up to 96 tickets, which can only increase your chances. Guaranteed Jackpots – Join the daily fling between 6pm and 8pm and you could win the £10 jackpot. Tickets begin at 2p, so buy them up and hopefully you’ll enjoy a win or two. £250 Boost Every Month – On the 15th of every month at 8pm you could win the £250 balance booster, designed to make the end of the month that little bit easier. Again check out the Jackpots tab and you can buy up to 96 tickets. 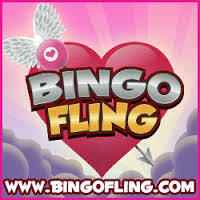 Bingo Fling is available on Facebook, so make sure you ‘like’ their page to keep up on the latest news and promotions. If like us you love making new friends as you play bingo, then check out Bingo Flings chat room and games. You can win amazing prizes and a bestie in one go! If you have any queries or problems, you can contact Bingo Fling via email, telephone or by checking out their extensive list of FAQ’s. Bingo Fling accept the usual banking methods including Visa Debit, Visa Credit, Visa Electron, Maestro, Mastercard and Solo. So if you’re ready for an online fling, then head to Bingo Fling and we’ll take you through to register and get spinning! Good Luck.